The messed up part about this issue is that if you’re trying to use OpenSSL and/or ANY of the scripts that come with Kali to validate SSLv2 related findings, the tools will not return valid results unless you un-patch the OpenSSL that ships with the distro! 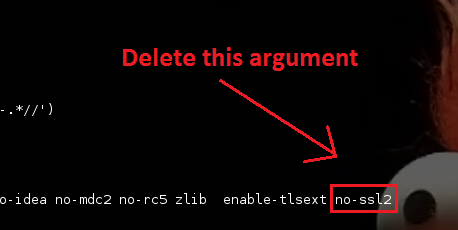 Edit the “debian/rules” file and delete the “no-ssl2” argument. Now we can repatch to make sure we're inline with all of the other kali changes. If all went as planned, you should not get any errors when attempting to connect to something using OpenSSL when specifying SSLv2 only. Hi, thanks you very much. Thanks! There is a bug report filed about this: http://bugs.kali.org/view.php?id=386 - Let's hope it becomes the default in the future. Thank you so much, helped a lot!